The Creative Case; exploring the impact of music on health and well-being in early-childhood. The All-Party Parliamentary Group (APPG) on Arts, Health and Wellbeing, Creative Health: The Arts for Health and Well-being could be the most influential policy document since the Marmot review; Fair Society, Fair Lives (2010), in making the case for early intervention and giving children the best start. But it does more than this. It advocates and defines the arts as robust health interventions. The arts can no longer stand alone outside social policy and the future of a healthy society. Sally Anne Donaldson, Creative Health: The Arts for Health and Wellbeing, an early childhood sector perspective. At Stratford Circus on Wednesday 21 February 2018, we are delighted to welcome keynote speaker and researcher to the All-Party Parliamentary Group on Arts, Health and Wellbeing (APPGAHW), Dr Rebecca Gordon-Nesbitt from Kings College London. In her keynote, Dr Gordon-Nesbitt will outline the context of the Inquiry conducted by the APPGAHW (2015–17) and how the ensuing report, Creative Health: The Arts for Health and Wellbeing, took shape against a backdrop of the social determinants of health, with findings arranged across the life course. She will detail the distribution of arts participation across the social gradient, making the case that access to the arts (and health) is a matter of social justice; provide evidence of the benefits of music to children in intensive care and to mothers with postnatal depression and their children, and explore the potential impact of this important policy document for the early years music sector. Sally Anne Donaldson, founder of Tea Dance for Little People and Creative Homes, organisations committed to improving the wellbeing of families in creative ways, which encourage a playful approach to home life and routine. Marion Friend CBE, consultant in arts and education and a life coach, mentor and facilitator with a particular interest in career development, and in supporting individuals to explore and reach their potential. 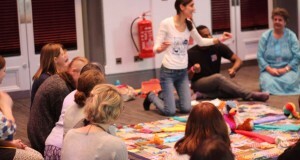 Vanessa King, London Early Years Music Network core member and early years music leader for London Symphony Orchestra. Janet Leigh from Royal Alexandra Children’s Hospital, Critical Care Team. Zoë Palmer is a writer and early years music specialist. She has worked with Spitalfields Music for the past seven years developing Musical Rumpus, an interactive opera series for babies aged 0-2. She also played a key role in the Royal College of Music and Imperial College Centre for Performance Science Music and Motherhood study, which explored how group singing ‘with baby’ could influence recovery of postnatal depression. Jo Stockdale, Programme Director and Trainer at Child Learning and Development Advisory Centre and evaluation partner evaluating Wishing Well interactions with children and families at The Royal Alexandra Children’s Hospital. Rb&hArts, Royal Brompton and Harefield Hospital’s innovative arts programme. Stratford Circus, our host arts venue and delivery lead on The Acorn Project, a strategic early years arts programme in Newham and Barking and Dagenham. Dr Alison Street’s extensive experience in early years music spans over 30 years. Her doctoral research focused on mother-infant singing interactions. She is a member of MERYC (Music Educators and Researchers of Young Children). David McKenny and Jo Danks from Pulse Arts; a community interest company delivering person-centred music practice with patients, their families and hospital staff. Jo White, Project Manager at Wishing Well. Wishing Well works in partnership with NHS trusts and charities across the South East to bring live interactive Music for Wellbeing into hospitals and hospices.